This is one of the largest tracts of lowland heathland in the region where 90% has been lost in the past 100 years. This endangered environment supports an array of plant and animal communities and it is because of this rich biodiversity that it has been notified a Site of Special Scientific Interest (SSSI), by Natural England. It is also part of the Thames Basin Heaths Special Protection Area (SPA) for it's heathland birds. Three of the species found here are protected by European legislation. Hazeley Heath is a peaceful and relaxing environment for those wishing to enjoy nature at it's best. The southern section of the common is owned and managed by Hart District Council and the northern section is owned by the RSPB. Parking is available in the lay-by on the B3011 or walk from the central car park in Hartley Wintney. Buses stop on the B3011 by the water tower. There are a network of paths, some on firm gravel and some across wet heathland which have boardwalks in places. Dogs must be kept on leads between March 1st and September 15th due to ground nesting birds. Disabled access is restricted to gravel paths. 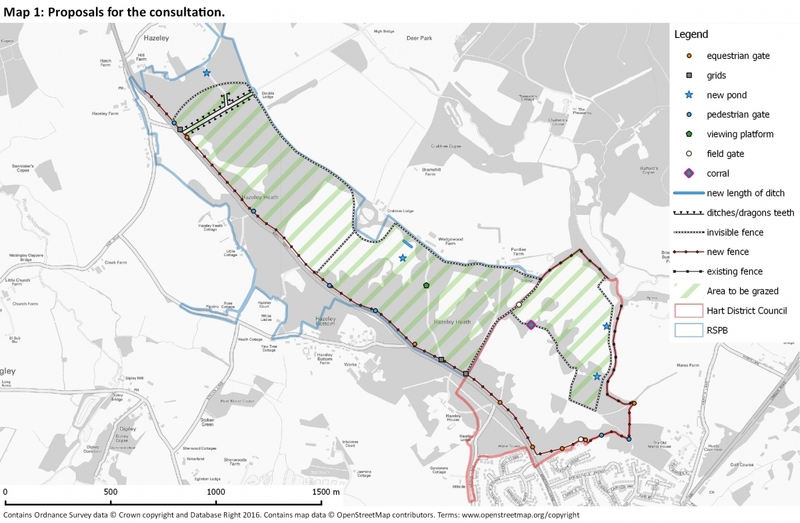 We are now in the second phase of this consultation, looking specifically at options for grazing the heath. Here you can download the full report and the information produced for the first stage of this consultation. The primary purpose of the Consultative Group is to support the smooth implementation of the agreed Management Plan. Following a consultation in 2006, and a subsequent grazing trial within enclosures on the heath, Hart District Council and RSPB are carrying out a review of the management of Hazeley Heath Common to ensure that it continues to provide the best outcomes for people and wildlife. The first stage of the consultation was completed in February. Expert consultants Footprint Ecology have produced a set of recommendations which we will be consulting on this summer. If you would like more information please contact the countryside rangers.